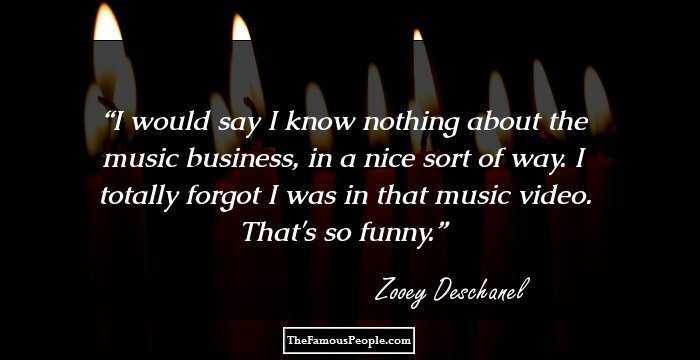 A collection of insightful quotes and sayings by Zooey Deschanel on love, Christmas, music, tradition, hate, fun etc. 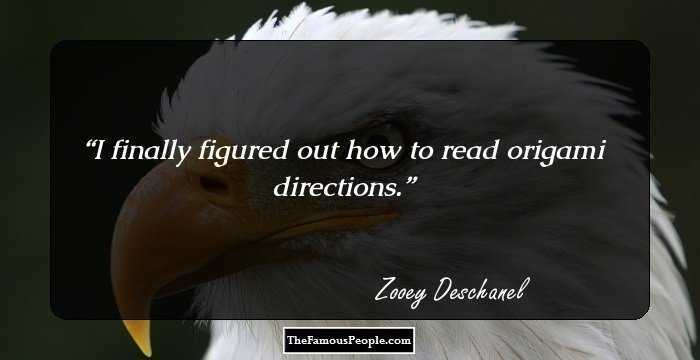 Zooey Deschanel is an American actress, model and singer. She loves picnics, clothes and singing. While in school, she dreamed of becoming a Broadway singer or a child actor and pestered her parents for allowing her to take auditions. In her interviews, she has spoken extensively about her childhood, mentioning funny incidents that make you smile automatically. Now an established actor and singer-songwriter, her aim is to make “people feel like they are not alone.” For her, “that’s just the greatest feeling”. In interviews, she has talked freely about what actually led her to become an actor or what she thinks about feminism. Let us now go through some of her quotes, which reveal to us her views on many important aspects including heartbreaks, weight loss and coffee. 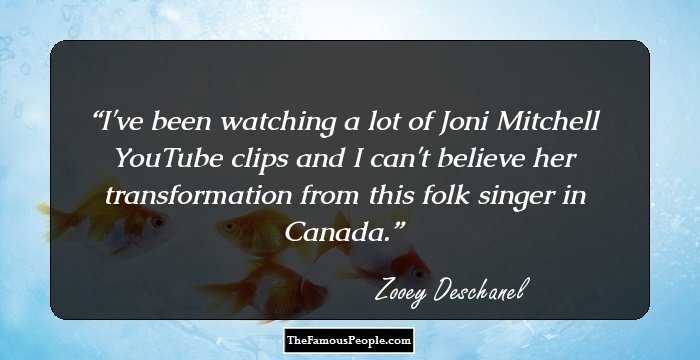 I've been watching a lot of Joni Mitchell YouTube clips and I can't believe her transformation from this folk singer in Canada. 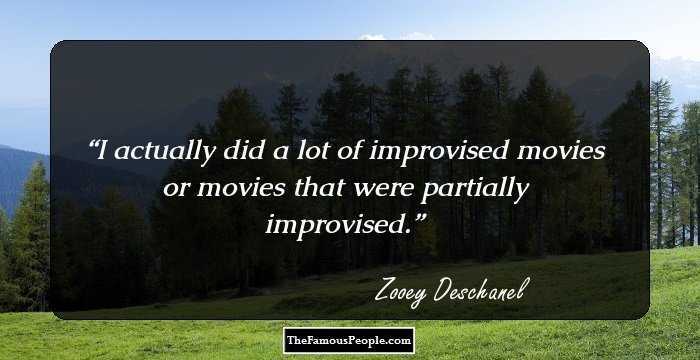 I actually did a lot of improvised movies or movies that were partially improvised. I would say I know nothing about the music business, in a nice sort of way. I totally forgot I was in that music video. That's so funny. 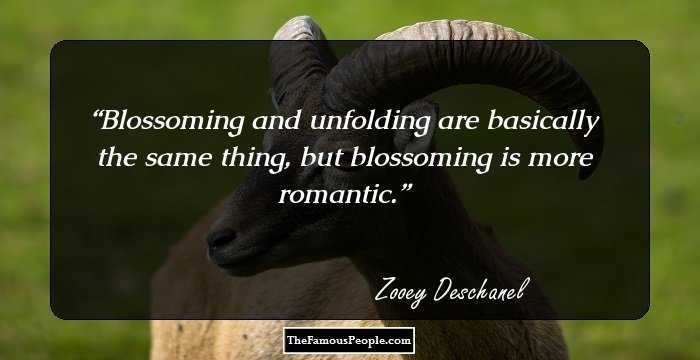 Blossoming and unfolding are basically the same thing, but blossoming is more romantic. I finally figured out how to read origami directions. 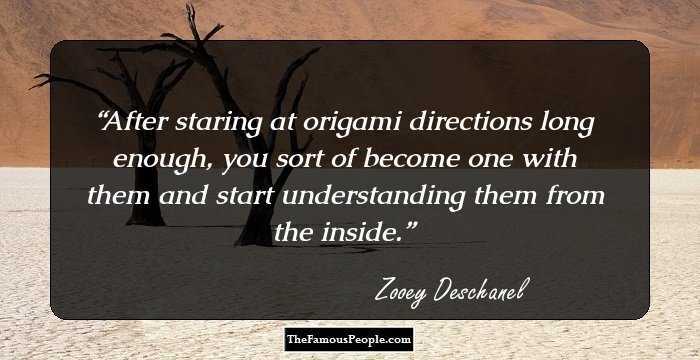 After staring at origami directions long enough, you sort of become one with them and start understanding them from the inside. I have a music career as well, so I was going to either be an actress or a musician. Then, I did both. But, I was always going to do something creative. I've always had a really great time being in movies and writing music when I get home. The more creative I am, the more it feeds into other creative aspects of my life. I'm not playing a comedy. I want to be playing the truth of the moment, and then have the comedy come out. I'm not cynical about love at all. I'm very practical. I think love takes up a lot of time. It's really fun to say no sometimes. I just don't want to discount how fun it is to say no and exercise your right to say no, and - as a girl - it's important to know how to say no... and that no means no! I think good actors tend to be really funny. There are a million examples of not feeling the jazz, but using the jazz. I don't thrive in a word-perfect environment. It can make you a little crazy when you are too connected to a product. I already have the weird experience of having a name for myself personally that's connected to someone that's in the public eye. So you have me, Zooey Deschanel, and then there's Zooey Deschanel's public persona. I'm not really that interested in pandering to an audience of people that are going to judge me before they hear me. If they hear it and don't like it, that's totally fine. I feel like making music because - and this has much to do with the way I was able to make this record - there's more of myself in it. I'll write and make chords with my voice sometimes if I don't have an instrument even though it takes a million times longer. I don't like to plan harmonies too much, because there's something fun that happens when you just sing a pass, then sing another pass, and layer them on top of each other. Writing music is really personal, and it's a really exciting thing to participate in because represents the full creative process: It feels like something is coming from nothing. In making a movie, you're part of a big machine. Even in a small movie there are still so many people involved in the process, and it costs so much money to make. I've always been really picky about roles and make a point of reminding myself that it's not about the money - because, obviously, there's a lot of money to be made in this business if you're willing to do anything. I don't have control over what's on screen, and that's terrifying. I can't even remember the first time I started singing. I'm always trying to do stuff I haven't done before or challenge myself so I'm not resting on my laurels all of the time because if I just found my little niche and never left it, I'd be pretty boring, I think. I'm a person who gets better with practice. Getting older is awesome - because you get more practice. I don't think there are that many awesome roles out there, whether we're talking about movies or TV. I've never pursued a role. I always hear stories about actors going after parts and I'm, like, 'How do they do that?' It seems so weird. It seems like a total myth or something. For some reason, people look at me and laugh. I don't know why. Everyone needs a theme song! 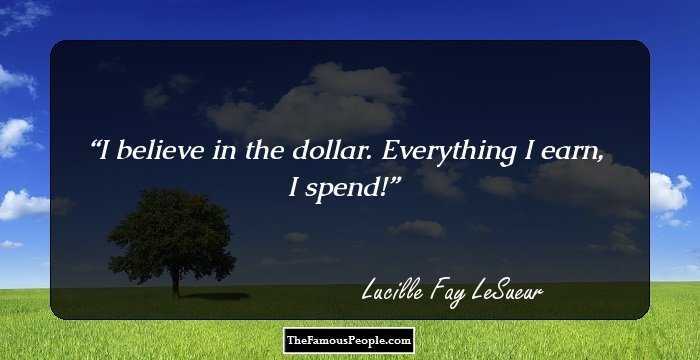 It should make you feel like a million dollars. Well, my piano's really beautiful. I actually have two pianos. I have a Yamaha upright from the '60s that's blond, wood, and black, and I also have one from the '20s from Chicago - not a well-known brand or anything. It's a lot harder to do an ensemble because your energy is going in so many different places, and you have to cover everybody. You have to sort of split your attention. Not that there is anything wrong with confessional songwriting, there are plenty of people that do that I admire. I think it is great; it just isn't how I do things. People sometimes say, 'Oh, you were a movie star,' and I'm like, 'No, I was a supporting actress.' I wasn't an A-list actress, and I'm fine with that. I'm proud of what I did in film. The moment you sense someone is making something because they think people are gonna buy it or like it, it's just so phony! The public has a nose for phony like nobody else. There are so many cute vintage dresses made out of synthetics from the '60s and '70s - but they're so itchy and hot. It's not worth it! The red-carpet thing of premieres and parties is probably my least favourite part of my job. 'Pastoralia' by George Saunders is one of my favorite novels. Nothing's better than a picnic. I like to make colored xeroxes of things. I clip out pictures of Liza Minelli and her husband from magazines and I fax them to people anonymously. No, I've been singing forever. I started out doing musicals. I think that was part of the reason why they gave me the part, because I sang. Know what suits you. Now I understand proportion and recognise the shapes that look good on my figure. I LOVE DOWNTOWN LA and I relish any opportunity to spend time there. I think there's a certain space people have decided I occupy - the funny-sidekick thing. There's a vegan and gluten-free bakery called BabyCakes that I love. They've got shops in New York and Los Angeles. Their stuff is amazing. We all know guys who've had their hearts broken in real life; we just don't usually see it in the movies. I just feel like growing up in Los Angeles, you learn, 'Well you're never gonna be the prettiest girl in the room, so just don't even try.' I mean, I care about being pretty, but it's not my most valued thing. I get embarrassed a lot of times getting attention, but I like being onstage. Do you know what I mean? If I'm in a crowd of people and they're all looking at me, I will feel embarrassed. It's a strange dichotomy. I feel there are tone singers, and there are more vocal gymnastics singers. And I think that's amazing when people can do that, but I think there's room for the tone singers. And there aren't a lot of them. Growing up in Hollywood meant there were a lot of film stars' kids at my school - but no conspicuous wealth. It wasn't cool to show off that you had money. I wasn't really the most charming person, socially - it took me a long time to develop my people skills - but the one place I was always comfortable was onstage, acting or singing. I have been a harmony enthusiast since I was a child, singing in choir and with friends growing up. I always put a ton of harmonies on my demos. I'm the worst at picking what movies are going to do well. I have no idea. I'm really surprised if a movie I like does well. I did not have a date to the prom. I went to my junior prom alone, and my senior prom, I was doing my first movie. I went in a limousine with, like, a bunch of people to my junior prom. It was a group date. Proving people wrong is probably my favorite thing to do. You can't expect to make no effort. 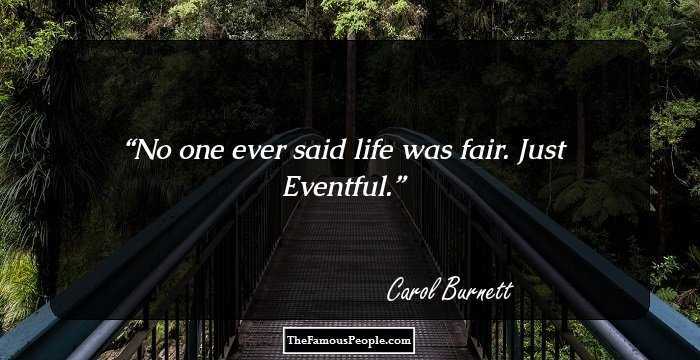 You still have to make the effort and be kind and understanding. Love is individual to each person and I don’t think you can define it before experiencing it because it isn’t going to be the same for everybody. I'm into sincerity in music and sincerity in art. If it doesn't feel true, I don't want to do it. Things that are too dramatic scare me. I think that's why I don't always fit into the world of performing arts. 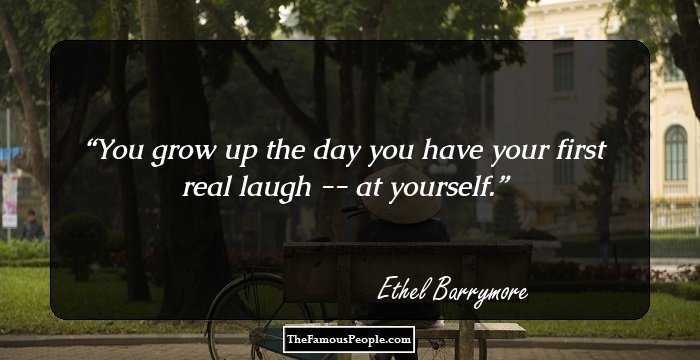 Humor is a part of spirituality. If you're in the public eye and you have young girls who look up to what you do, they're going to look to you for certain cues, so you have to take that as a responsibility, whether you think you deserve it or not. For those of you who tried, but didn't make it, Settle down it's never what you think. The summit doesn't differ from the deep, dark valley, And the valley doesn't differ from the kitchen sink. I'm not going to say I'm a big girl. I'm a very small person, but I'm a healthy weight. That might be a little weird for Hollywood. It's strange because a lot of people are like, 'You can't change human nature-people are inherently negative.' I don't think that's true. If you expect the best from people, they'll step up. Making movies, you're like an independent contractor - you come in, you have a specific job, and a lot of what you do is completely manipulated, which is good and bad. If 'New Girl' had been a movie, I don't know whether I would have been given the opportunity to do it. I like playing sort-of-crazy people. There's something really, really fun about that. I never have time to have a dinner. I have to eat while I'm memorizing lines. The only way to maintain energy is to eat all day long. I must eat all day long. I don't know how to explain how, probably to my detriment, unselfpromoting I am. I used to have a cabaret act and I didn't even like to tell me people about that. I really hate selling myself. The average person tells a few white lies. I've personally never wanted to be 'the babe', and refuse to let vanity get in the way of my acting because I don't see my job as being a beautiful person. You don't have to wear expensive clothes to look good. I feel like songwriting is an experiment in empathy. Why don't we just sit and stare and do nothing? Nothing at all for a while I like the way you smile I could be your state and I could be your nation It doesn't get better than home, now does it? I'm a very positive person. I get excited easily, and I like to jump around. I would watch 'Wizard of Oz,' like every day, when I was two. I had a hard time understanding that I couldn't go into the film, because it felt so real to me. I think that it's our responsibility to create a world in which girls can grow up and not have to limit their dreams or possibilities. I want to be a freaking feminist and wear a freaking Peter Pan collar. So freaking what? Secretly, I think everyone who makes fun of California really does want to be in California. To be a gluten-free vegan is, like, the most difficult thing you can possibly be. There's something about guitars, they're just so big, you know what I mean? You're just like, 'Ugh!' It just seems so overwhelming. And the ukulele is, like, the opposite of overwhelming. I can't go on Gawker. I actually think the writing is really funny, but there is a chance that somebody is undercutting me. I don't like business talkers, you know, people who are constantly like, 'Blah blah blah movies.' I find it incredibly boring. I think every year I become happier because I become more comfident and more comfortable in my own skin.